tour of the shop. the inquired if i could make them a knife. all the time instead of a wall hanger as they first suggested. walnut. i'll use 1/8th 1095 to start with, for samples. I suppose a Chef's knife would be pretty useful for this type of gift. It would get used quite a bit and as long as they cared for it properly and kept it out of the dishwasher it would work with 1095. If you're making a set for the kitchen, I'd like to suggest one be a 5"-6" Santoku pattern with (or without) a Granton edge. They would learn to love it, even if they'd never heard of one before. Never heard of Granton edge. Had it defined by the goog. Eh? In some ways I see little difference in end use, type, style of use between a santoku or chef knife. Imo one defining difference might be the thinness of a good santouku. Mine is around 6". 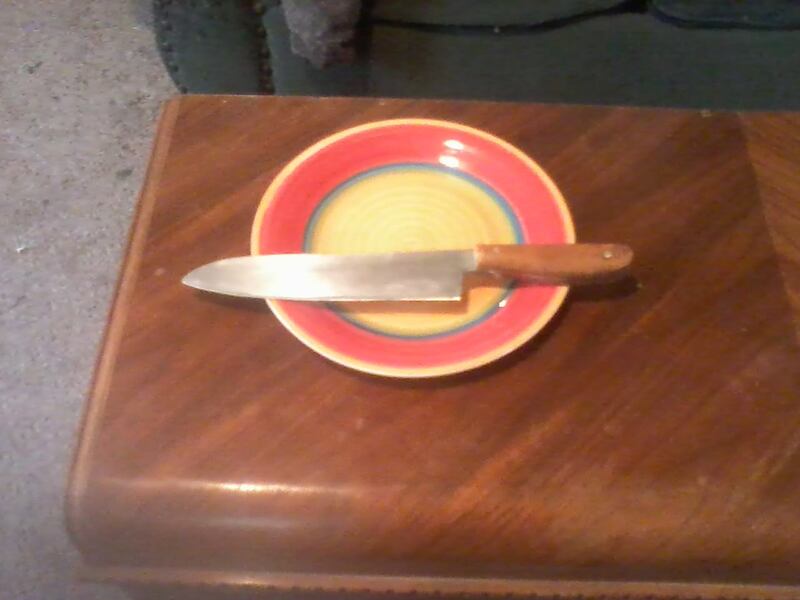 If I had one kitchen knife that would be it. Add a stiff boning knife- if I only had two. The third would be much harder to choose. So yeah, I agree a santoku is a good suggestion if one were making a gift knife for kitchen. Here's the rub though- gotta be hidden tang to get the right feel/balance- imho of course. 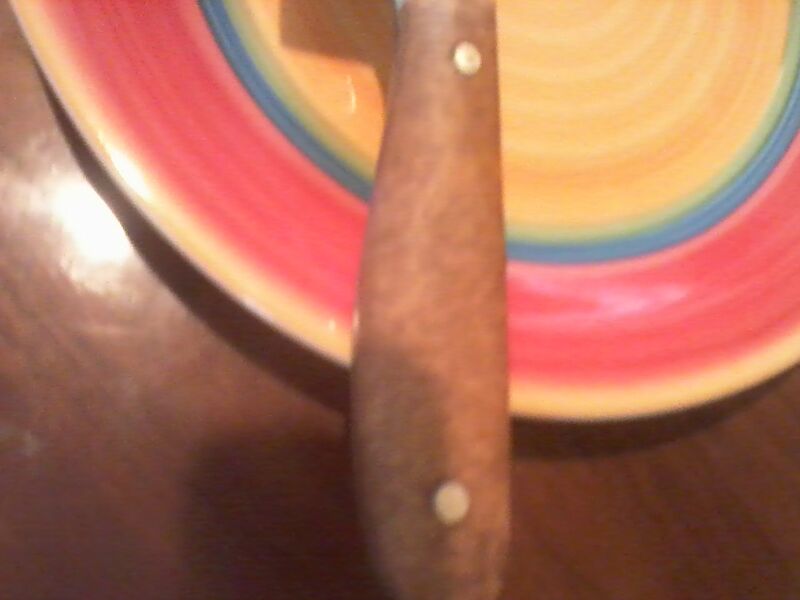 My Santoku is 5 1/2" and has a very subtle Granton. I don't think it is of much help. My son's is a quality one he used in the restaurants, and has an aggressive Granton (Kulliens?). I've noticed that does well on blocks of cheese, keeping the product from sticking to the blade. Be that as it may, to produce a quality Santoku would require a re-thinking of the metallurgy normal for making "bush knives". To make the blade thin and get just the right hardness on the edge would be tricky, I would think. just what is a granton? is that the curve on the front? It is the style of knife that has shallow convolutions or divots ground into the sides of the blade. The first ones I ever saw were present on the long straight slicers we used for slicing prime rib portions at the convention center I worked in back in the early '80s. They help to break the suction or drag that occurs when slicing meat or vegetables. The Granton Edge has the flutes Wolfy described. 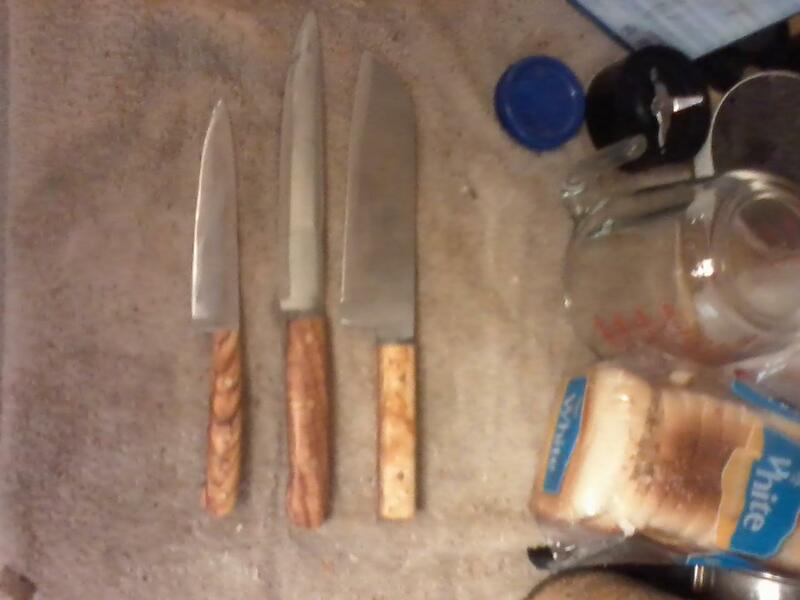 They are found on carving knives (re: Wolfy again), but more often on Santoku knives. You can find out more about it with a Google search. Also called Kullens. Wiki has a good description of them including how they differ from Chef's knives in thickness and grind angle. 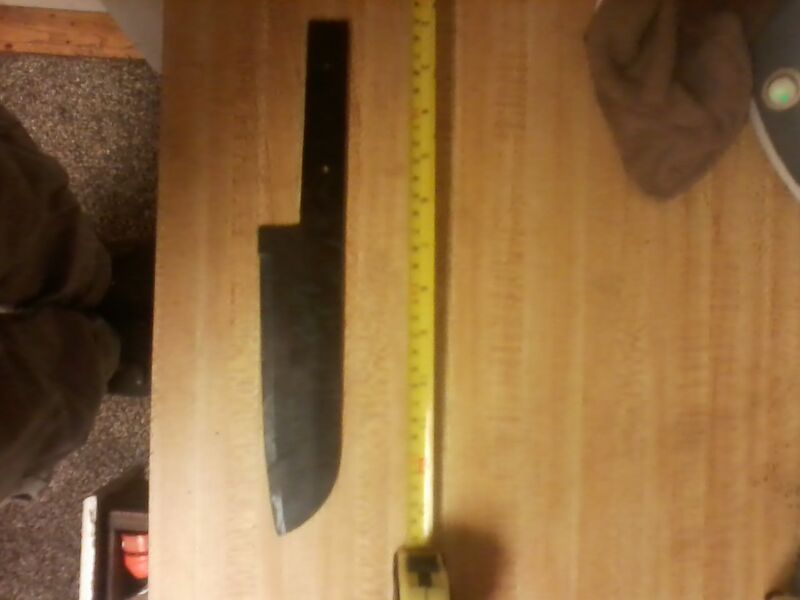 I'm not sure how hard it would be to put a Granton edge on a homemade knife. well this santoku won't have a granton edge. 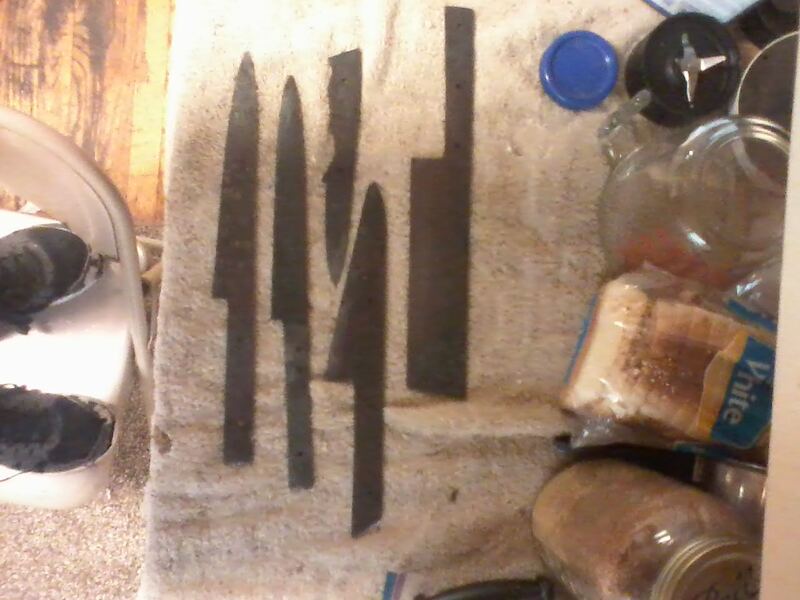 it will have masur birch scales and mabey a black canvas micarta guard w-brass pins. i just like full tang knives. right now it's in the oven destressing. will post a snapshot as i progress. I'm with you on the full tang. One thing about Santoku knives is their unique handle profile. well here's a few more ready for the kiln. 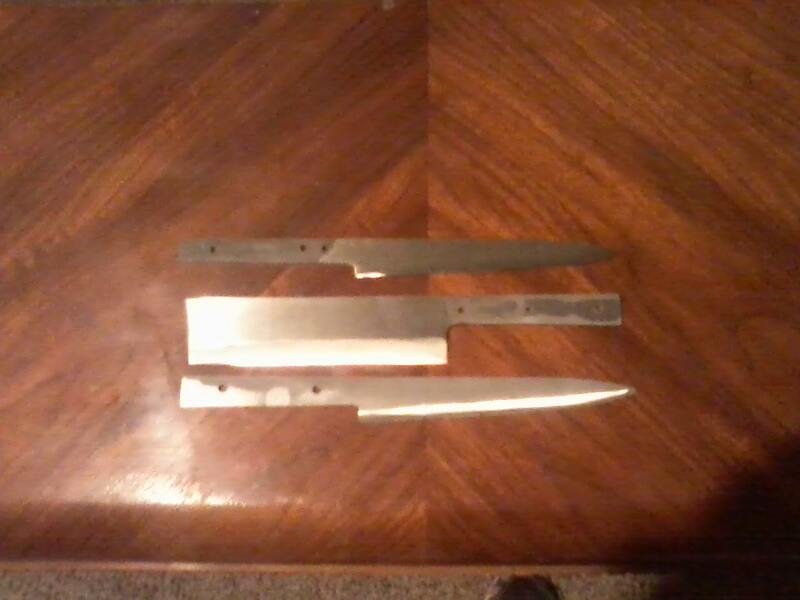 the two long ones are 1/8th in 1095.
the chopper is 5/32 1095.
i have a different style one i'll start on in the morning. Good job Mikey. Those look like great kitchen tools. thanks greg, gotta few more i'm doing. then it's back to bushcraft knives.